At this time of year you can hardly move for heart symbols; they’re on cards, on balloons, on cakes, and now they’ve even invaded your favourite Archaeological blog! 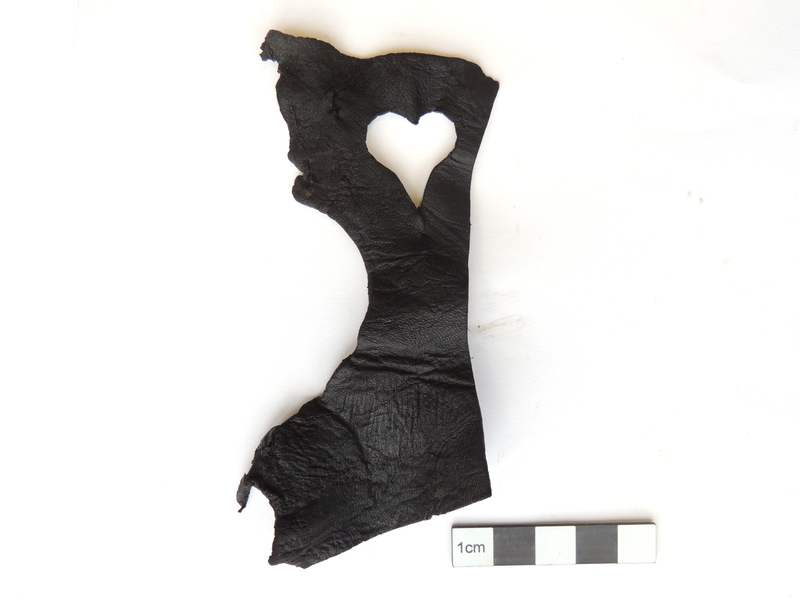 This small scrap of leather, very recently found in the Walbrook’s Roman deposits, is about 15cm long, with what looks like a small heart shape cut into it! Heart shapes were not widespread until late antiquity. Whilst they are known in the Roman world, it is not clear whether they were signs of love as we see them today. One of the possible origins of the heart symbol is the Silphium plant, the heart-shaped fruit of which can be seen on Greek coins. Now extinct, this plant once had many uses. Pliny, a Roman writer during the 1st century AD, wrote that different parts of the plant could be used for food, perfume or medicine. The plant worked particularly effectively as birth control, and was apparently widely used during the Roman period. This may be why heart shapes appear on the walls above Pompeii’s brothels. Valentine’s Day itself did not have any romantic connotations until the Middle Ages, but the Valentine myth has Roman connections. According to legend, the 3rd century St Valentine performed secret Christian weddings for Roman soldiers, who were forbidden to marry. To remind them of their faith, Valentine supposedly presented the soldiers with hearts cut out of parchment. Of course, we could just be looking at it the wrong way up. Its easy to get carried away interpreting a sign that seems so familiar to us, but this symbol could be any number of things including a leaf, or even a phallus. After all we know how the Romans loved their phalluses! !